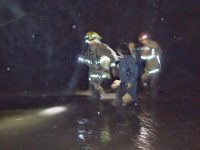 Flooding and mudslides killed at least five people in the Montecito area overnight, as a storm ravaged the Santa Barbara County community days after the Thomas Fire swept through its neighborhoods. The storm trapped numerous residents in or around their homes in various areas of Santa Barbara County early Tuesday morning. 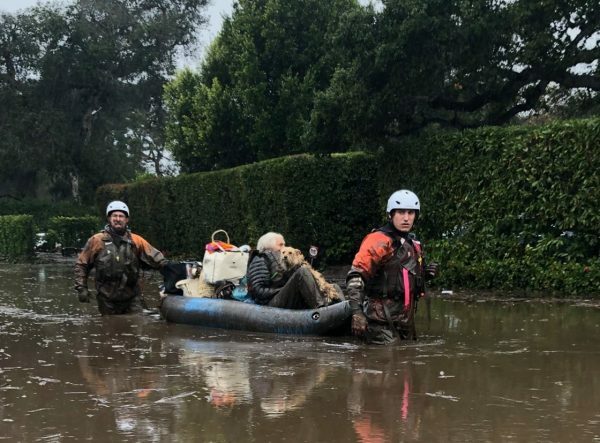 Some have been rescued, including a 14-year-old girl who was trapped for hours in a destroyed Montecito home. Susceptible to flooding and mudslides because of the recent fire, Montecito was covered in mud and debris following the first phase of the storm. Homes were destroyed, some of which were ripped off their foundation. Numerous cars around Santa Barbara County are currently stuck in mud or water. Trees and boulders have also been swept around the county in flooding and mudslides. A search dog is going through homes and debris on Tuesday, looking for additional victims. Parts of Highway 101 are closed in Santa Barbara and Ventura counties. Other roads are also closed, and residents have been urged not to drive. While San Luis Obispo County received rainfall, it avoided the destruction that occurred in Santa Barbara County. More rain and strong winds are expected later Tuesday.